His series of pinhole photographs from 1989 are images of seascapes that tip into abstraction. Recognizable topographic features disperse, leaving only the faint suggestion of the landscape. Pinhole photography relinquishes some of the control afforded by the analogue camera. 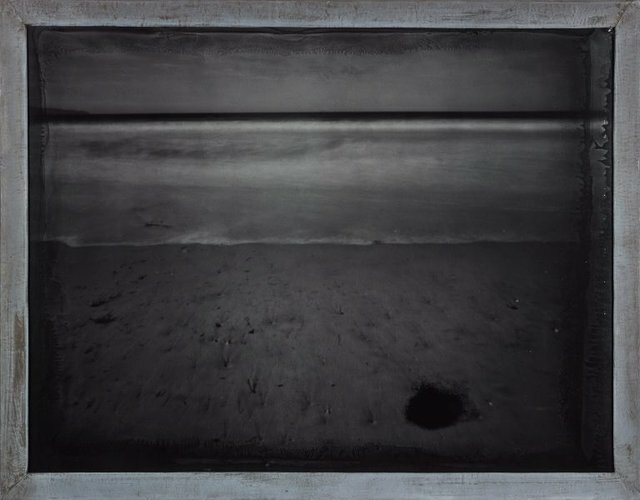 Stephenson’s ‘Untitled pinhole photograph No. 46/1’ and ‘Untitled pinhole photograph No. 49/3’ expose the unpredictability of this technique in the abrasions around the edges of each photograph that make the image appear as if it were disintegrating. These photographs were produced using protracted exposure times and the blurred forms that result from the motion of the sea make the monochrome scene ephemeral and indistinct. The lead coated timber frames, an integral component of each work, compliment the muted, charcoal-like tones of these photographs.